The folks over at Reverb.com have put together a run-down of their favourite reverb pedals, after doing a similar article about delay pedals a while ago. There are some obvious (i.e. : classic) choices and some surprising ones as well. From the article: “Given our name, it was only a matter of time before we pulled together our top reverb picks. Styles and technologies have evolved, but going back to the wall-of-sound of the ’60s and the gated snares of the ’80s, reverb has found its way into virtually all forms of popular music. Today, musicians have more reverb tools than ever to explore. Here are some of our favorites.” Go check it out! Okay, we all know that TC Electronic makes incredible effects. Their 2290 delay is legendary. Their G System, G Major and G Force: legendary. Their Nova series of pedals: legendary. But the TonePrint series of pedals is a unique opportunity to get in on the ground floor of something that’s going to become legendary. Because TonePrint pedals allow you to dial in your own sounds, sure, but they also give you access to finely tweaked effects designed by some of the best ears in the biz, including Dream Theater’s John Petrucci, Steve Stevens, Paul Gilbert, Bumblefoot and many, many more. The Hall Of Fame Reverb is but one pedal in the series. The others are the FlashBack Delay, Corona Chorus, Shaker Vibrato, Vortex Flanger, and the new John Petrucci signature modulation station, the Dreamscape. The Hall of Fame Reverb’s controls include rotary pots for FX Type, FX Level, Decay and Tone, as well as a toggle switch for Short or Long pre-delay times. There are stereo inputs and stereo outputs, a handy unscrewable battery compartment, 9vDC power supply jack, True Bypass stomper switch, and the same basic case shape as the company’s instant-classic PolyTune tuner pedal. SCOTTS VALLEY, CA • May 6, 2011 — Universal Audio (UA), a leading manufacturer of high-quality audio hardware and award-winning UAD-2 Powered Plug-Ins for Mac and PC, has released new UAD Software v5.9. Along with new features for the UAD-2 Satellite Firewire DSP Accelerator, v5.9 includes the highly anticipatedLexicon® 224 Digital Reverb plug-in for the UAD-2 platform. From the moment it was unleashed on the audio industry in 1978, the original Lexicon 224 Digital Reverb — with its tactile, slider-based controller and famously lush reverb tail — almost single-handedly defined the sound of an entire era, and remains one of the most popular and influential digital reverb units of all time. Performing as a solo acoustic act can represent either an artistic breakthrough or the kiss of death. It’s undeniably difficult to stand up in front of a crowd with only an acoustic guitar to shield you from the glare of public opinion, able to hear every little comment or conversation from the audience. While some artists are right at home in this environment, others could be forgiven for scurrying for the hills. While it’s easy to slip into the trap of just strumming some chords and warbling along, there are some tricks you can use to make your solo acoustic performance more distinctive, sonically varied, and unique. Let’s look at a few of them. The first thing to think about is what to play. Are you taking songs that were originally written on electric guitar, with thrashing power chords? Songs like this don’t tend to translate well into solo acoustic performance because the awesome power of a blazing 100 watt amp is such a big part of the sound, and playing the same part on an acoustic guitar can change a riff from “CHUGGA-CHUGGA-CHUG” to “dinka-dinka-dink.” Clever use of open strings and arpeggiation (breaking up a chord into one note at a time) can take an otherwise heavy riff and recast it with moody atmosphere that will service the song much more musically if you take a riff that’s not meant for an acoustic or clean sound and just play it verbatim. Take, for example, the main riff of that good old standard, Metallica’s “Enter Sandman.” For the song’s intro, Metallica took the same riff and moved it around a little, with some open strings and sustained notes, instead of just playing a clean toned version of the ultra distorted main version. Another pitfall to avoid is the vigorous thrashing of chords, unless the song really needs it for dramatic emphasis. With the limited tonal palate of an acoustic guitar compared to a fully augmented rock band, dynamic control becomes one of your most important tools. One quite intuitive and great sounding technique is to break up a chord by strumming pairs of notes, or strumming only the bass note on the first beat of the bar, and all the remaining notes on subsequent beats. This opens up the arrangement a lot more and allows the audience to mentally fill in what the song might sound like with a full band. The idea is to treat the guitar as six individual voices in a choir – you can have them all sing the same melody in the same octave for dramatic emphasis, but an entire concert’s worth of that same sound can be a little bit of an onslaught. Breaking up a chord into groups of notes allows each section of the chord to breathe, and creates a more supportive bed for vocals. Next, there’s guitar tone. Despite some great technical advances (like the D Tar Mama Bear acoustic preamp, Takamine’s CoolTube valve-driven onboard acoustic guitar preamp system, and various other analog and digital modelling technologies), a lot of players still just plug the guitar into the mixing desk and treat the audience to the unpleasant quackiness of piezo pickups. 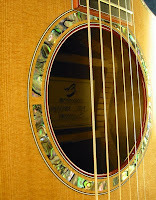 The problem with the pickups built into most acoustic guitars is that they transfer only the direct vibration of the string, but what we, the listeners, know as a true acoustic guitar sound also includes the effect of the sound reverberating inside the guitar body before leaping out of the sound hole. If you don’t have a dedicated acoustic processor, a little bit of this mysterious aural voodoo can be added with reverb and delay pedals. Dial the reverb to a ‘small room’ setting, set the effect mix to a ratio of about 75% dry signal and 25% reverb, then feed the reverb pedal into a delay set for a very quick single repeat of around 40-60 milliseconds, again mixed down relatively low, and with the treble of the repeat reduced, if your delay has a tone shaping feature. What you want to do is mimic the sound of a guitar string echoing only within the space of the guitar body, not an entire room. Then if you want to add traditional delay or reverb sounds, and have an extra available pedal or processor, the resulting echo or reverb will sound more like it’s being applied to a real acoustic guitar, instead of just repeating the trebly, hollow piezo sound. Finally, the best acoustic performers I’ve seen make it feel like you’re sitting in their living room. They do this by being relaxed and displaying lots of personality and confidence, especially during between-song banter. The worst ones I’ve seen make you feel like you’re intruding on their private time, by mumbling or generally ignoring the audience (probably out of nerves, but still, this makes for a terrible entertainment experience).